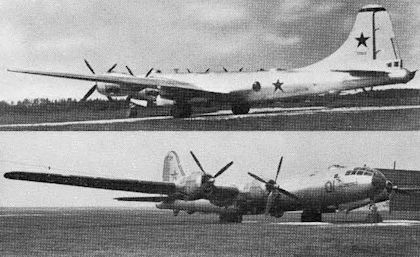 These Tupolev Tu-4s (220002 top and 2005102) could, but for their national insignia, have been products of the WW II Wichita and Renton assembly lines rather than late 'forties progeny of factories on the far side of the Urals, the Boeing B-29 Superfortress and the Tu-4 being externally indistinguishable. Whereas the B-29 Superfortress normally mounted twin 0-5-in (12,7-mm) machine guns and a single 20-mm cannon in the tail, the Tu-4 replaced this combination with a pair of 22-mm NR-22 cannon, a similar pair of weapons being mounted in each of the four remotely-controlled barbettes. Ту-4 был одним из самых значимых советских самолетов раннего периода холодной войны. Советская разработка отличалась от американского прародителя более мощным вооружением - 23-мм пушками вместо 12,7-мм пулеметов. 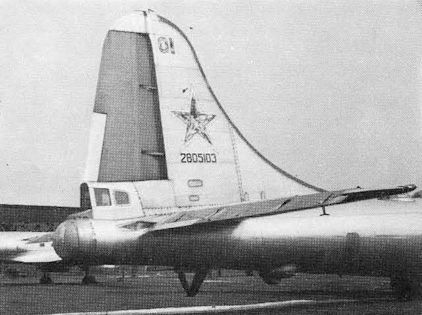 The photo shows the tail position of the Tu-4, but the NR-23 cannon have been removed. На этой компоновочной схеме видны основные особенности Ту-4. У советского самолета отсутствует герметичный туннель для прохода экипажа, имевшийся у американского Superfortress. An official Soviet drawing of the Tupolev Tu-4 strategic bomber. The features annotated are: (1) Bombardir (Bombardier); (2) Piloty (Pilot) ; (3) Radist (Radio Operator); (4) Verkhniy strelok (Dorsal gunner); (5) Kormovoy strelok (Tail gunner); (6) Bortinzhener (Flight engineer); (7) Shturman (Navigator); (8) Bortovye strelki (Beam gunners); (9) Radiooperator radio-lokatsionnoy ustanovki ‘Kobalt’ (Operator of “Cobalt' radar equipment). 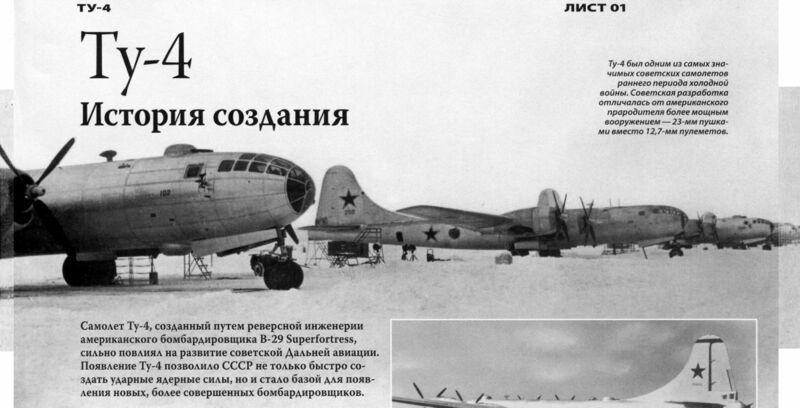 The appearance of the Tupolev Tu-70 commercial transport derivative of the Boeing B-29 Superfortress over Tushino in 1947 provided proof positive that rumours of Soviet production of the American bomber were founded in fact.